1987: Days of our Lives' Bo & Hope left Salem. 1970: On Days of our Lives, Julie (Susan Seaforth) finally settled the score with former best friend Susan Martin (Denise Alexander) by marrying the man Susan loved, Scott Banning (Mike Farrell). 1978: On Ryan's Hope, Pat (Malcolm Groome) arrived in the middle of Faith's (Karen Morris) wedding to Tom Desmond (Thomas MacGreevy). 1981: On Dynasty, the first season ended with a courtroom cliffhanger. 1983: On All My Children, Jesse (Darnell Williams) and Angie (Debbi Morgan) were married for the first time. 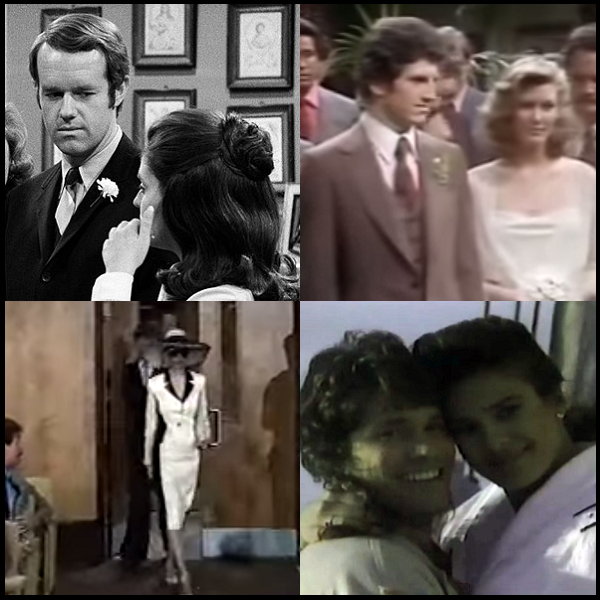 1984: On Days of our Lives, Liz Chandler (Gloria Loring) married Neil Curtis (Joseph Gallison). Newcomer Don Diamont made his Days of our Lives debut as Carlo Forenza. Diamont currently stars as Bill Spencer in The Bold and the Beautiful. 1984: On Another World, Roy Bingham married Henrietta Morgan. 1987: On Days of our Lives, Bo (Peter Reckell) and Hope (Kristian Alfonso) sailed away as "Whatever We Imagine" played in the background. Reckell and Alfonso both left the show but would return in 1990. 1990: On The Young and the Restless, Skip (Todd Curtis) and Carol (Christopher Templeton) received bad news from Michael Crawford. 1999: On Another World, Paulina (Judi Evans) asked Jake (Tom Eplin) for a $10,000 loan. 2007: Shelley Hennig debuted as Stephanie Johnson on Days of our Lives. 2010: All My Children aired a tribute episode to the late James Mitchell, who played Palmer Cortlandt for many years. 2010: Chad Duell debuted as Michael Corinthos III on General Hospital.